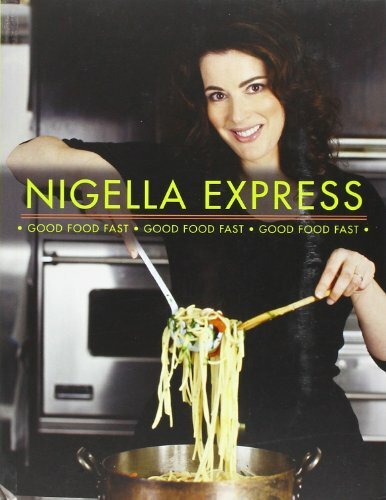 Featuring fabulous fast foods, ingenious short cuts, terrific time-saving ideas, effortless entertaining and easy, delicious meals, Nigella Express is her solution to eating well when time is short. Here are mouthwatering recipes, quick to prepare, easy to follow, that you can conjure up after a long day in the office or on a busy weekend, for family or unexpected guests. This is food you can make as you hit the kitchen running, with vital tips on how to keep your store cupboard stocked, freezer and fridge stacked. When time is precious, you can’t spend hours shopping, so you need to make life easier by being prepared. Not that the recipes are basic - though they are always simple - but it’s important to make every ingredient earn its place in a recipe. Minimise effort by maximising taste. And here too is great food that can be prepared quickly but cooked slowly in the oven, leaving you time to have a bath, a drink, talk to friends, or do the children’s homework. Minimum stress for maximum enjoyment.